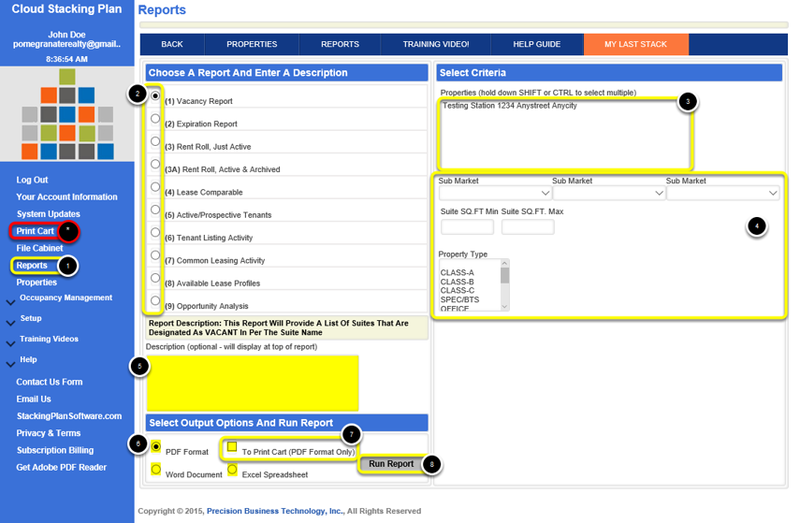 From the Reports screen you can select the report you want to run along with the property you wish to run it for. As an Excel (.xls) file this will place the information in cell formatting for each statement. Can be used for .csv file imports. Or select any other Criteria to Filter the properties included in the report. * Now click Print Cart from the menu at left. In there, you will see all documents you have placed in the cart. Select one or several of your items and then click View/Print. This will combine your items into a singular document. Print Cart Options: If you wish to run several reports, but want to print them all at once or combine them into a single PDF document, choose the PDF format, check To Print to Cart and then click Run Report. Your report will be placed in the print cart queue. File Cabinet Options: You can choose to save a copy of your consolidated document in your file cabinet by selecting a File Cabinet Category and assigning it a name.